Either you love to try new dishes for breakfast or for lunch. 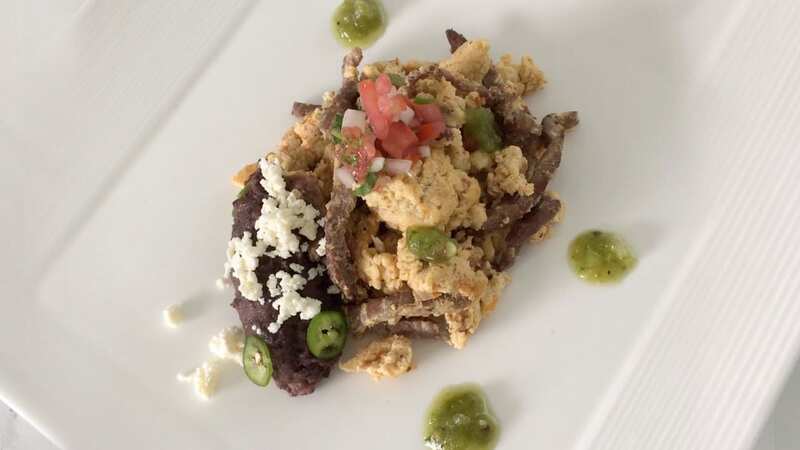 Then this Machaca with Egg Recipe is something for you. This dish is a typical Mexican dish that is known to be known since 1928. In the town of Cienega de Flores or better known as “Aunt Lencha”, they began to prepare the machaca with egg for the workers in the town. These workers were building a stretch of the Monterrey to Laredo road. And since then, Mexicans have taken this dish to their hearts! Incredible! The proteins that contain the egg are of an excellent quality, these contribute the amino acids that our organism requires. A single egg provides approximately six grams of protein, among the most important functions of proteins we can find that it contributes to the formation of muscle tissue, is an essential component of all cells, are vital part of the immune system, carry substances in the blood And are also part of certain enzymes, hormones and neurotransmitters. In the bud are also present two nutrients called lutein and zeaxanthin that belong to the family of carotenoids, are antioxidants that help prevent visual damage that relate to age, such as macular degeneration. Among the many studies that have been done on the egg, it has been shown that eating one or two a day poses no risk of increasing cardiovascular disease and also has an essential nutrient for cardiovascular and cerebral functioning called choline, This helps metabolize and decrease homocysteine, which is a great benefit since its elevated levels are associated with increased cardiovascular disease. This dish looks amazing! A fantastic morning dish that everyone should try. Especially now as it is summer! Give it a try! In the oil, add the onion and chili and then add the tomato. Then you need to fry for a few minutes and add meat. So, you can buy or make beef jerky if you want. But you can also use chicken or chicken broth powder; Fry for one minute and add eggs and salt to taste. It should be cooked very well until the eggs are tender. It is served on a platter and is accompanied with flour tortillas and refried beans or the pot. Now you have a fantastic breakfast dish to try out. If you want to start your day in a perfect way, serve this dish at breakfast time. Although it can also be used to recharge energies during the day and in this way you will be able to continue your work stronger and better also. For lunch or even as a light-dinner dish. You can also try to add tacos with tortilla flour. Eating these taco slices alone or with guacamole and avocado slices. Now, that must be heavenly amazingly tasty. Also! If you don’t want this dish to become so spicy. It is ok to just use normal pepper instead of Jalapeno. Mexican dishes are hot usually, but we know that many of our readers is mixed from every corner of the world. So, we care about you also. Bon Apetit! And do try this dish out!